Tipperary's involvement in this year's Allianz hurling league ended following a third one-point loss in the current campaign, this time at the hands of Dublin, 1-21 to 0-23 in the quarter-final in Semple Stadium last Saturday. Unfortunately, Tipp never got to the heights of the previous week's performance though the players did try to replicate that pattern of play, but the Dubs were equal to the task. As a result, Tipp were never ahead of their opposition and now with the league boxed off, turn the attention towards the all-important Munster championship first round date with Cork in Páirc Uí Chaoimh on May 12th, a mere seven weeks away. So, to wrap up on the latest league result, including Saturday night the stats now show, Tipp have played Dublin 36 times in the league, with Tipp on 22 wins while Dublin have 10 and there have been 4 draws. As indicated last week, the last Dublin win on Tipp soil was on February 10, 1946, when they won 9-6 to 2-2 at Thurles when Tipp were the reigning 1945 All-Ireland champions. After that the teams played 11 more times ahead of last Saturday, 8 in Thurles, 2 in Nenagh and 1 in Moneygall and Dublin lost all 11 games, a statistic they will have been glad not to have added to last weekend. The loudest cheer of the day greeted Brendan Maher's (Borris-Ileigh) return to action when introduced in the second half. With other injured colleagues nearing full rehabilitation as well, hopefully all will come through club games in the next few weeks unscathed. This will enable the county team the opportunity, everyone is waiting for, to have a right crack at the championship this year and hopefully be definite contenders when the championship gets to the serious business end in August. If they can achieve that, last Sunday's loss will be all but a distant memory. It was also a one-point loss for the Tipperary footballers last Saturday as Kildare took the two points available in round 6 of the Allianz football league by 1-11 to 2-7. Having been nine behind early in the second half Tipperary put in a late burst with goals from Liam Boland (Moyle Rovers) and Dan O'Meara (Kiladangan) drawing the sides level well into injury time, only for the Lilywhites to somehow find the crucial score to take the win. However, a big plus for Liam Kearns' side was the first appearance of the year of Michael Quinlivan (Clonmel Commercials) who has also recovered from injury enabling him to take a starting place on Saturday. So, it all comes down to the final round of the league and while it may not have been in anyone's script, Tipperary's home encounter against Clare on Sunday next, March 24th, at 2pm in Semple Stadium is now a must win affair if Tipp are to have any chance of staying in Division 2 next season. A win or a draw for Armagh against Cork coupled with a Tipp win would see Tipp staying up. Last season in the corresponding fixture Cusack Park it was honours even as both sides finished 0-11 apiece. That is a result all of Tipperary will be hoping the team avoid on Sunday next. We send best wishes to the team and management ahead of this game and call on all Tipperary supporters to please come out behind the team on Sunday and give them the support required to drive them on to victory. All the while, in the stand supporters will be keeping a close eye on events in Armagh. Adult pre-purchase tickets are also available up to midnight on Saturday night for €15 and adult match day tickets are €20, U16’s go free. The referee will be Fergal Kelly. Best wishes to Tipperary referees on duty this weekend. Derek O’Mahoney (Ardfinnan) will take charge of the Allianz football league division 1 fixture between Mayo and Monaghan on Sunday next in Elvery’s MacHale Park, Castlebar, while Sean Lonergan (Moyle Rovers) will be in the middle when Westmeath and Longford square up in TEG Cusack park, Mullingar in division 3, also on Sunday. The Tipperary Water U21 A and B football finals took place last weekend and congratulations to JK Brackens and Kilsheelan-Kilcash on their respective successes, with both crowned 2019 champions. JK Brackens Óg made it back to back victories when they defeated Cahir 1-8 to 0-9 in the Tipperary Water U21 A Football Final. And in the Tipperary Water U21 B championship Kilsheelan-Kilcash took the honours defeating Moyne-Templetuohy/Thurles Gaels 2-15 to 0-8. The following are fixtures in county post primary action this week, best wishes to all schools involved. Thurles CBS v High School Clonmel/Our Lady’s Templemore, date and venue to be confirmed once the outstanding quarter-final has taken place. Best wishes to all contestants in the Mid Scór Na bPaistí A and B Finals which will take place this weekend. The A final is in Moyne Hall on Sunday next March 24th at 2pm, while ahead of that the B final will be held this Friday March 22nd in Ballycahill at 7pm. For a full list of acts going through to each final please follow the Mid Scór Facebook page which will give details of each final. The Irish Collegiate 1 Wall Finals were hosted by Dublin in St. Bridget's GAA Club, Na Fianna GAA Club and Croke Park last Saturday. Tipperary players featured in 3 finals winning 1 and runner up in 2. 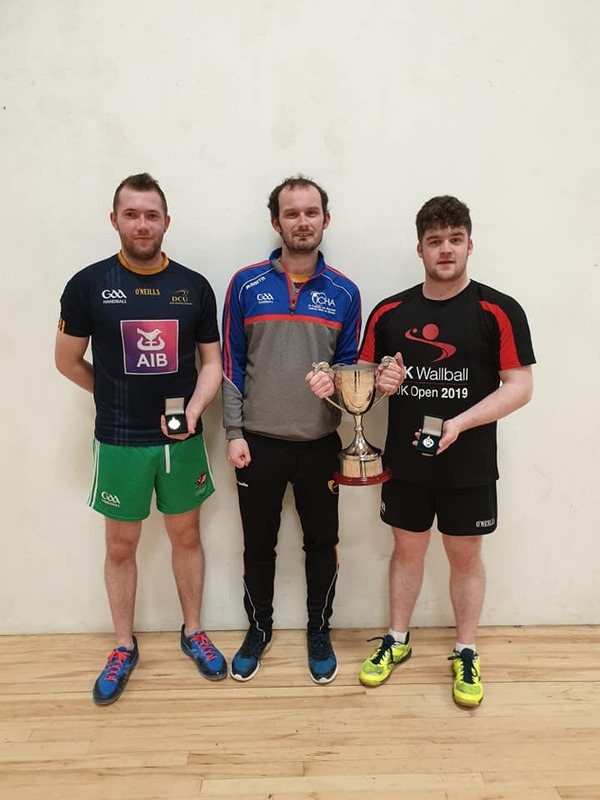 In the Men's Open congratulations to James Prentice (LIT) as he defeated Terry McElvaney (DCU Alumnus) 15/13, 15/9 in the final following a good win in the semi-final against Adam Walsh (CIT) 25-14. Pictured right is Terry McElvaney, referee Geoff Atkinson and champion James Prentice. In the Women’s Open, Eleanor Percy (NUIG) was defeated by Ashling Mullin (NUIG) 15/8, 15/8 and in the Women’s A final Síle Spain (NUIM) was defeated by Kelly Curran (NUIG) 15/10, 15/14. March is gambling awareness month. Problem gambling has become a major concern in modern society. Gambling can be difficult to give up but there are services and supports available no matter how hopeless the situation may feel. If you have a gambling problem or you are someone concerned about a family member or friend who you think might have one the following websites will be of help. Lent is a time when people traditionally try to quit smoking, for encouragement and help visit quit.ie or call 1800 201203. If gardening or observing wildlife is your pastime you will enjoy browsing through biodiversityireland.ie here, you will find Irelands Citizen Science Portal which will allow you submit sightings and view records of plants and wildlife. This website has a list of what’s happening in the garden during the changing seasons and has a list of the many events being run around the country throughout the year.